Fall winds are sweeping through, but Summer refuses to give up entirely. 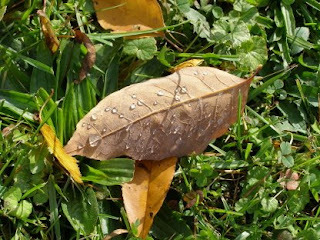 I was watching the wind in the trees today--it looked like it was raining leaves! Luckily I have very few deciduous trees--mostly spruce--so I don't have to rake many leaves. But I love to hear the wind in the cottonwood and poplars. Birds are flocking, geese are flying overhead day and night--and the peepers have given up. Lynnie has a new coat to keep her warm and I just got her a new fleece blanket (with pink flowers) to sleep under. And, yes, I am still knitting socks--we may all need to wear several pairs at once with the price of heating oil! Here's something I've been doing for several days and I hope you will give it a try too: You know how people (not us--those others!) do stupid things, especially when driving--like cutting us off, not using turning signals, yada, yada, yada. Next time, instead of getting mad, try saying "Thank you, thank you very much" in your best Elvis voice! I can't stop smiling after I say it and it makes me feel better! I know, I know, it sounds silly...but try it! It doesn't cost anything--and it takes fewer muscles to smile than frown. Go ahead, try it now...bet you can't keep from smiling! Until next time, happy quilting! Thank you, thank you very much (LOL). The big question used to be "where were you when President Kennedy was shot?" Still an important question for many, but being replaced with "where were you on 9/11/01?" It doesn't seem possible that seven years have passed since that day. I was in Burnt Hills, New York, on my very first "away" mission. I had lectured the night before and was in a church hall with a group of women for the labeling class. We had just started when a church official came running in to tell us about the planes. Several of the women had family in the airline industry. We kept running from the classroom to the sanctuary to watch unfolding events on their television. So very hard to grasp what we were doing with what was going on elsewhere in our country. 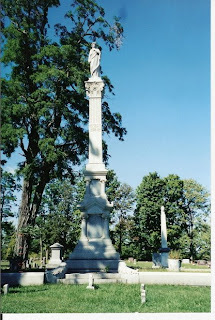 On my way home, I stopped at a cemetary that I had passed the day before on my way to Burnt Hills. I had noticed the beautiful statuary and wanted to take a closer look. This is one of the pictures from that day. How blue the sky was, how perfect the day. As I traveled the Thruway that day I stopped a couple times at the rest areas. People were literally milling--watching the televisions, feeling and looking like they were at loose ends--what should we do, what else would happen. So much silence, so much disbelief that this could happen to us--in America, on our home soil. As 9/11/08 comes to a close, let's give heartfelt thanks to those brave soldiers fighting to keep our country safe. A prayer that the families who lost loved ones on 9/11/01 have found a measure of peace and comfort--realizing at the same time that nothing can replace what they have lost. Thanks also to the men and women who responded on that fateful day--firemen, police, everyday citizens who became heroes that day. We owe you all a debt of gratitude. Remember how America was covered with flags after 9/11/01? 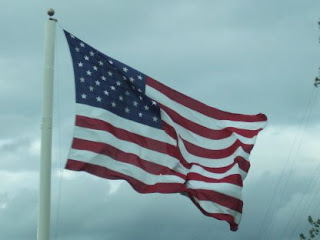 Let's keep those flags flying and that American "can do" spirit alive every day. We are the greatest nation on earth and UNDER GOD!!!! Let's not forget that...ever!!!! After the "Sock Gone Bad" post, I think I was caught in a time warp--how can it now be September 4? Since August 12, I have taught 12 classes, finished an entirely hand pieced new Bliss sample and started another, added binding to several quilts, hand quilted on a piece I started several years ago, and even managed to partially vacuum the house! Oh, and I worked 4 days at a local quilt shop while the owner welcomed her first grandchild--a beautiful baby girl named Samantha! 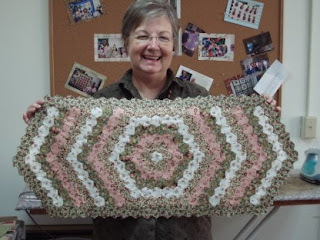 Here's a picture of Sylvia with her hexagon tablerunner. Sylvia took a hexagon hand piecing class with me a few months ago. She had basically decided that hand piecing might not be her favorite--then, in another hand piecing class with me, she brought along this fabulous table runner--all hand pieced with 3/4 inch finished hexagons! She's crossed over to the hand piecing side! I begged her not to make me crop her face out of the picture--and she reluctantly agreed--I love this picture! You go, Sylvia! 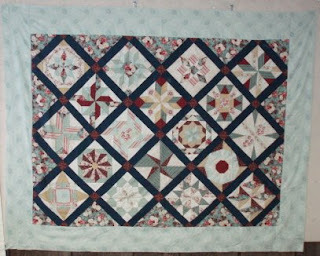 Diane C. of Watkins Glen (you've seen her work in several prior posts) took my machine pieced Friendship Quilt class. She recently gave me this picture of how she is displaying it! I absolutely love it and thought you would enjoy seeing it as well. Doesn't it look like something from Country Living? Kathleen took the Bliss 1 class two years ago at Calico Gals (you remember, the hand pieced one). I saw her in late August and she had this with her--the finished top. 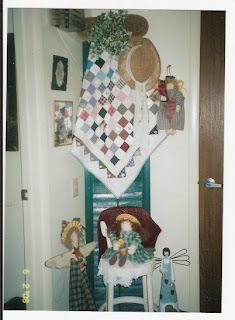 Kathleen recently retired and is looking forward to lots more quilting time. I love her top (remember the weird pictures are entirely my fault--her quilt really is much flatter in person!). It's always so exciting to see finished tops! Congratulations, Kathleen! As for the knitting--I again ripped out the pink sock (I only had about 2 inches of ribbing done this time) and using size 1 needles cast on the ruffled sock again. It is coming out much better--and almost everyone I have talked to has had problems with that yarn. So I will not be buying it again. Someone asked me why I didn't just throw it away--and I must admit that I did think about that--but it was pretty and it annoyed me to be defeated by a skein of yarn! I'll post pics of the sock when it is done. I also got a beautiful skein of Dream in Color Yarn sock yarn called Smooshie in petal power (cream, pale pink and pale brown). I cast on for a mock cable pair of socks from a pattern that came with the yarn--I am swooning!!!! The yarn is soft and knits like a dream. The pattern has a 10 row repeat and is looking just like the picture! Pics of that on another day as well. For those of you still wondering if I will ever finish the batting discussion--the answer is yes. I have samples of silk, cotton (bleached and unbleached) and the new Thermore. I plan to machine and hand wash samples and machine and air dry samples to see how they react. I'll photograph each step and post the results. For those parents whose kids went back to school this week--YEAAAAA!!!!! For those of you who are the teachers of these kids--welcome back and thanks to all of you who have the difficult task of teaching our upcoming leaders and citizens. "Mama said there'd be days like this, days like this, mama said." I know there are days when you wonder why you took on this thankless job, but then you get one of those rare and special moments when a student who has struggled and struggled finally gets something--thanks to you. It makes every moment of the struggle worthwhile (that's my story, and I'm sticking with it!). As the hustle and bustle of fall starts, remember to give your machine a good cleaning, change that needle--remember to do so before it breaks, if possible ;-) and give yourself at least a few minutes every day to do something that makes your heart sing.